Alzheimer’s, Dementia & Other Conditions | Full Circle Home Care Inc.
Caring for someone with Alzheimer’s or Dementia can be physically and emotionally exhausting on families. Alzheimer’s care requires patient caregivers who know how to respond, communicate and serve a person suffering from this disease. Many families choose to place Alzheimer’s patients into a facility that has a lockdown. For those looking at other options, home care might be the right choice. Full Circle Home Care wants to help families make objective decisions about the level of support they need for their loved one. We’re here to provide information about your options that make your stressful decision easier. We have caregiver specialists who specialize in looking after clients with Alzheimer’s, dementia and other conditions. Our caregivers can provide companionship, supervise recreational activities, assist with basic activities of day-to-day living, and ensure a safe environment for your loved one. They are also experienced with managing behavioural changes, and providing a consistent routine to reduce confusion and anxiety. Many also have advanced training with the Montessori Methods for Dementia. Full Circle Home Care’s trained caregivers are there help maintain your loved one’s dignity and independence. We feel it’s essential to find ways to ease the emotional frustrations that come with Alzheimer’s disease and dementia-related disorders. These difficulties don’t just affect the person living with the condition, but also the entire family. Trained caregivers bring families closer together so they all can support the person living with dementia. Because each of our clients is unique, our dementia-care program treats them uniquely. 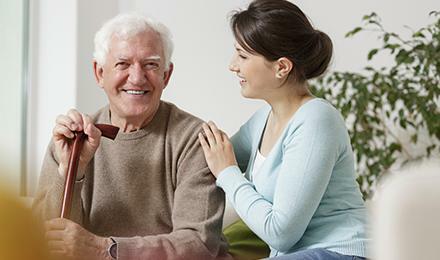 Full Circle Home Care customizes dementia care plans for each person and our specially-trained memory care experts understand the complexity memory impairments can create in a home. When someone is diagnosed with dementia it can be overwhelming and hard to know where to turn. Our caregivers receive specialized training that helps them put together a dementia care plan that is specific to the current abilities and stage of dementia. This dementia care plan can and will be modified as the disease progresses and skills change. Our goal is quality of life for you and your family, and we achieve this with a person-centered approach to care. different levels of care and assistance. In the first couple of stages of dementia, a person may still be able to function independently despite some memory loss, but by the third and fourth stages of dementia, they will begin to need help with basic chores and getting around. By the fifth or final stages of this disease, someone with dementia cannot function without help. At Full Circle Home Care we provide you and your loved one with quality Alzheimer’s care for any stage of this disease. We recognize that Alzheimer’s affects each person differently and therefore we tailor our care to meet your unique needs. Our caregivers are here to help preserve dignity and independence for those who have Alzheimer’s disease, and respite care for the family too. The hallmark of dementia is severe loss of memory, especially short term memory. When people with dementia find out their mental abilities are declining, they begin to feel vulnerable and require of constant reassurance and support. Because the symptoms of dementia get worse with time, the people close to them need to do everything they can to help in order to help the person retain their sense of identity and feelings of self-worth. Our caregivers provide many services aimed at making the life of those living with dementia easier, such as personal care, meal preparation, assistance with activities of daily living (ADLs), and supervision while treating them with respect. Caring for a person with dementia is one of the toughest tasks, especially when you see how it affects a person’s cognitive abilities over time. You get to take care of your loved one in ways you never expected before, sometimes against their wishes. If you are the primary caregiver for your loved one with dementia, you have to take care of yourself as well, because your personal care is inseparable from your parent’s care. If you are on the verge of depression, the person you are caring for will become unsettled and sad as well. Maintaining your other relationships should be seen as maintaining your life line – without them, you are risking your own well-being. Before your loved one gets used to a routine which includes only you, it is a good idea to introduce other caregivers. This way, you can get a much needed break and your loved one gets specialized care for the time being. Full Circle Home Care provides relief care at your convenience. Whenever you feel like it is getting too much, we’ll send a caregiver over to take over your duties so you can recollect yourself. The Montessori Methods for Dementia are based on the theory and practices of the Italian physician Dr. Maria Montessori. These methods have been applied to patients with dementia by pioneering psychologists and care workers to provide a novel and effective treatment for the symptoms of dementia. The results speak for themselves; many patients report these methods as maintaining or enhancing their abilities, improving self-esteem, and reducing or eliminating responsive behaviors. By supporting the person and the environment, Montessori Methods for Dementia™ improve the quality of life of those living with dementia while maintaining the maximum amount of dignity and independence.